Zoar Village, located in Ohio’s Tuscarawas Valley, functioned from 1817 to 1898 as a communal society. Formed by German separatists seeking religious freedom, Zoar became one of the most successful experiments in communal living in America’s history. One cardinal principle in the Zoarite’s faith and practice was the refusal to bear arms. 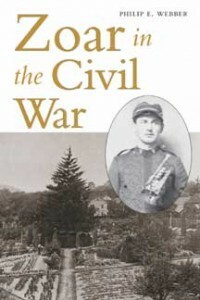 In the 1860s, with the rise of the Civil War, conflict emerged between the community’s pacifist stance and its strong support for the Union cause and for the abolition of slavery. Some Zoarites continued on the path of conscientious objection; others chose the path of conscientious participation in the Union army. Philip E. Webber is a professor of German at Central College in Pella, Iowa, where he has been a faculty member since 1976. His scholarly and pedagogical projects have enjoyed the support of the National Endowment for the Humanities, the Iowa Humanities Board, the Mellon Exxon Foundations, the American Philosophical Society, and various educational agencies in Germany, Belgium, and the Netherlands.